Documents on the discussion process and early programme development detail the setting-up of the German GBIF System. Members: Node project leaders plus the respective speaker of the IT-Experts Commission and of the Committee itself. Function: integrating policies, providing guidelines and over-all directions; co-ordinating institutionalisation and development; scheduling the content of Status Seminars; public relations; integration of resources which currently not take part in the GBIF-D system. Meetings: Node co-ordinators meet at least once a year, convened by the speaker, or at request of committee members. Speaker and deputy speaker are elected by the node co-ordinators for a period of three calendar years. Responsibilities: representing Committee resolutions; membership in German delegation to the GBIF Governing Board; (subject to agreement of BMBF) representation in the GBIF NODES Committee; editing of common pages in the www.gbif.de domain; maintaining the information flow between the GBIF-D System and the international activities of GBIF. Members: Walter Berendsohn, Christoph Häuser, Gerhard Haszprunar, Renate van den Elzen, Regine Jahn, Wolfgang Kießling, Erko Stackebrandt (Dagmar Fritze), Dagmar Triebel and Michael Türkay. Members: IT-Experts nominated by the nodes (max. 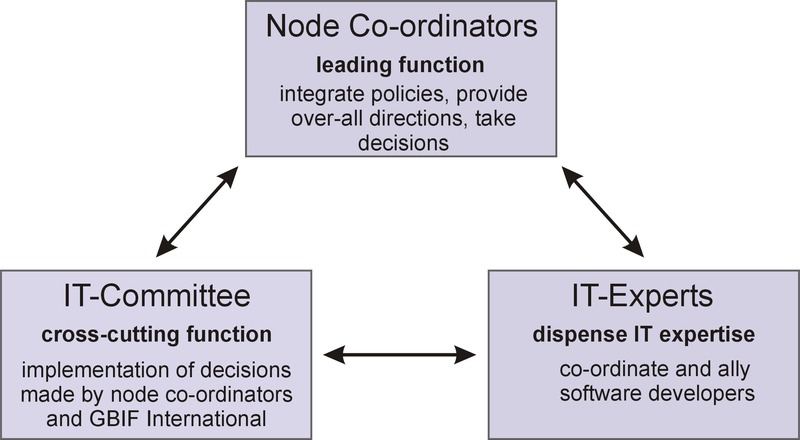 one per node) who are permanent staff of the institutions directly involved in the node implementation plus the speaker of the Node Co-ordinators Committee and the organiser of the IT-Expert group. Function: cross-cutting function; implementation of decisions made by node co-ordinators and GBIF International; identifying and forwarding problems to IT-Experts for discussion, technical co-ordination of funding proposals. Meetings: Convened by the speaker of the Commission or at request of at least four nodes. The IT-Commission meets at least once a year. The speaker is elected by the IT-commission. Responsibilities: representing proposals of IT-commission to the IT-Experts and node co-ordinators; communication between the nodes. Members: open upon invitation for all experts who are involved in the implementation of components of the GBIF-system or in other projects directly engaged with the supply of information in the GBIF-System. Function: co-ordinating and allying software developers, exchanging experience and development of synergies; formulating recommendations for the IT-Commission. Meeting: Meetings and workshops are organised as required. The Organiser is elected by the node co-ordinators until recalled. Responsibilities: organising the work of the group, organising workshops and the general communication process among experts; maintaining the information flow between IT-Commission and Experts Group.